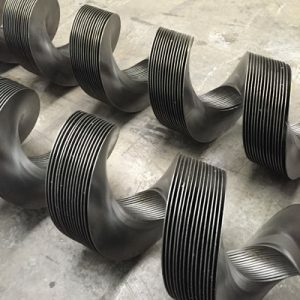 Auger Supplies WA offers both retail and wholesale service. A standard wholesale discount is offered to Engineering & Repair Workshops, OEM’s and Re-sellers, regardless of quantity purchased. For manufacturers wishing to purchase in Bulk quantity, we have five tiered levels of discounts based on meterage with your best possible discount being when you purchase Barrel & Flighting together, or pre-order flighting. WHY PURCHASE FROM AUGER SUPPLIES WA? WHERE DOES OUR AUGER BARREL COME FROM? 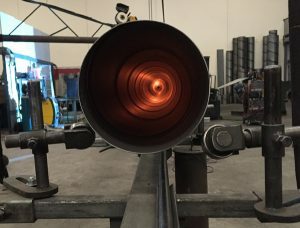 We roll our Auger Barrel locally in our Canning Vale factory. 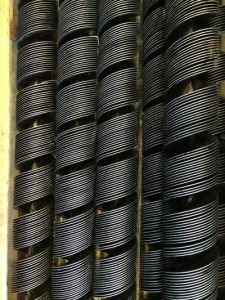 Our turnaround time is usually very fast from order to supply, and we hold up to 150 tons of coil in stock so we are always prepared and ready to roll. We use Q345B or HA350 coil which are both high tensile and harder wearing than the standard MS Brightform or Blackform other manufacturers use. The thicknesses available vary on the size of the tube being rolled, but range from 1.6mm to 3mm thick. We also hold smaller stocks of SS304 coil in 2mm thickness. Bulk orders are rolled to order so you can specify the lengths you require. WHAT CAN WE SUPPLY THAT YOU CANNOT SOURCE ELSEWHERE? Do you currently use segments for your large outload augers? We can supply continuous flighting with an outer edge of 5mm or thicker for heavy duty applications. The benefit in continuous flighting over segmented is in product cost and also fitting cost. 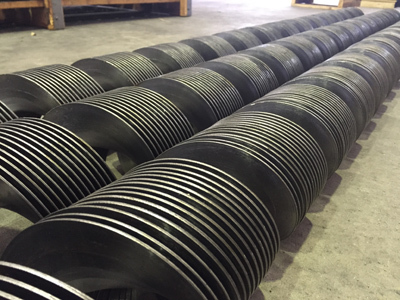 If your auger section is 2800 long or 3500 long or whatever we can usually supply that length and there is no waste. Do you favour the use of segments due to the heavy “wear & tear” factor on your augers? We are excited to be introducing FLIHARD Continuous Flighting to the Australian market! FLIHARD is a hard wearing European steel which has a Brinell Hardness of 230 to 280, compared to Flitech’s standard carbon steel which has a BH of between 150 to 180. Flihard is typically used in the European equivalent of our Chaser or Mother Bin. It is extremely hard wearing and as such there is no need for the material to be as thick as Mild steel. An 8mm Continuous flight in Flihard gives a 4mm outer edge and will outperform a 6mm Mild Steel segment. To give you an idea of comparison, our Australian Bluescope Grade 350 steel only has a Brinell Hardness of 140 to 180, Grade 250 has a BH of 120 to 160 and unspecified mild steel can be down to a BH of 100. STAINLESS STEEL continuous flighting is also readily available and we stock the commonly used sizes. WHAT SIZE FLIGHTING CAN WE MAKE? There is a 95 percent chance that whatever size flighting you require we can supply. There are obviously some restrictions in manufacture of certain sizes but anything from 40mm to 600mm OD is in the realm of possibility. While special sizes are only made to order, we always carry in stock a decent quantity of each standard size of flighting to match our barrel. Standard flighting has a square pitch, but if special ordering you may nominate the pitch required. Please keep in mind that if you only require a small quantity of a unique size it may be cheaper for you to talk to us about segmented flights. WHAT QUANTITY CAN YOU BUY? Continuous flighting is cut into lengths as it is made and our standard sizes are stocked in 1.5m and 3m lengths. We can also supply bulk orders at customer specified lengths nominated. Minimum bulk order quantities depend on material thickness but for majority of sizes 120m tends to be the minimum quantity to gain the bulk discount rate. Of course lesser quantities of a particular size can be ordered but the price will be higher. Flighting is similar to most products – the more of one size you buy the cheaper it gets. If “shopping” prices one should compare like to like. It is a waste of your time comparing our standard wholesale rate against a 300m rate from elsewhere. We will, of course, be more expensive. On the other hand it is highly unlikely our 300m rate will not be cheaper than what you can obtain from elsewhere. Your cheapest price will always be if you are able to order 8 to 12 weeks in advance, where we can import your bulk order and send it straight out the door when it arrives and there is no double handling. In this instance you will find our price more than competitive. Where we have to supply small or large quantities out of our stock it will cost more than pre-ordering purely because of stocking and handling costs. Where the auger flighting comes in a bundle it is fairly easy to determine at a glance if the pitch is consistent. Well made flighting might have from 15 to 20 lengths screwed together and one end of the bundle will look the same as the other. Some manufacturers have trouble screwing 5 lengths together because they will just not fit if the pitch is not consistent. Other than a professional looking, well performing auger, the beauty of consistent pitch means lowering freight costs as you can fit more in one bundle and lesson the space your cargo takes up. CAN WE AID YOU IN THE MANUFACTURE PROCESS? 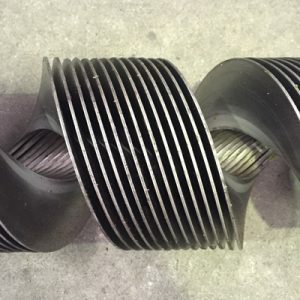 Some of our wholesale customers find that their time can be better spent on other areas of manufacture and request of us to make up the internal auger screw and sometimes the auger casing as per their specs and component supply. This is particularly the case where barrels are galvanised as we can fit customer supplied parts prior to sending to the galvaniser who is 5 minutes down the road. We can also import the internal auger screw already manufactured and balanced as per your specs from our supplier Flitech. Then all you have to do is fit to the casing! HAVE YOU THOUGHT ABOUT TRANSPORT? We supply bulk orders Australia wide. For our eastern states customers, more often than not trucks are leaving the west empty and so “back-loading” is cheaper than you may think. We always strive to find the best possible price for your freight, but are more than happy for you to organise your own freight if you have a carrier you wish to use.